Brick edging is a cost-effective, quick and easy way to add a visual element to your backyard and help to neaten up your landscaping by creating clear lines and borders. 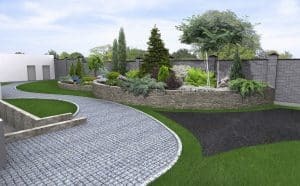 Brick edging is also incredibly versatile; you can use landscaping bricks for lawn edging, use edging bricks to create boundaries for your garden beds or even use them to make an edge for driveways, pathways and other areas. Everlast Services have been landscaping for over 20-years, and we know how to use brick edging to transform your backyard. We source a wide variety of bricks, ranging from traditional redbrick to more striking colours, like black brick. The best part about brick edging is that we can often source material from construction sites, as well as our projects. This means the material is recycled and you can save money on source material costing. We can look after your whole brick edging project, from design to installation or supply you with the material for your DIY-project. We’ll even pass on our expert tips! We love watching people transform their backyards, and that’s why we offer our brick edging services and materials because we know what a difference such a simple solution can make. Why Choose Everlast Services for All Your Brick Edging Needs? As a family-owned company, we care about our reputation. Our reputation has been built on excellent customer care, and we continue to demonstrate this care on every job and project we complete. We never leave a project until you are 100% satisfied with our work and conduct. We give back to the local economy wherever we can, by sourcing local products and employing people from the local area. You can be sure that every cent you spend with us will go right back into the community that sustains us all. We offer first-class service at competitive prices. Our loyalty to local suppliers is rewarded with discounts, and we always include these discounts on your quote. We offer a huge range of landscaping services, as well as concreting, decking and fencing. This means we can look after you for all of your landscaping and home improvement needs.